Here we honor the beloved animal friends that have blessed our lives. If you would like to submit a tribute, you can do so here or download a submission form and mail it to: Arms of Aloha, Attn: Editor, 970 N. Kalaheo Ave, Suite A308, Kailua, HI 96734. Flash came to join Liz and Kiku’s family through sheer determination. He came to their house and started calling at the window to be let in, sticking it out through 40 days of wind and rain! Eventually he prevailed and became an “indoor cat.” They decided to name him “Flash” because he moved so quickly, running off to play and then popping back up suddenly to get cuddles. He loved to give kisses and snuggle, eating salmon, playing with his toys Mousey and Stringy, and playing chase and hide-n-seek. He was very much loved and is deeply missed. Fred’s owner, Jill, got him when he was just a few weeks old. Jill was 20 years old and in college, and it was her first time living alone. She decided to get a furry companion to help ease her anxiety about being alone at night. She responded to an ad for free kittens and never found the correct address – however, when a neighbor came out to offer help, it turned out they had free kittens, too. And so it was meant to be. Fred was lucky to have so many loving people in his life, but especially Jill, Tai, Takako, and Takako’s cat Hana. Tai was… allergic to cats but loved Fred. Fred’s favorite place to take a nap, no matter what they did to try to prevent it, was right on Tai’s pillow often making sure that he was planted there whenever Tai might want to jump into bed. Fred is also slightly famous as Tai owns a printing company and pictures of Fred standing on a rainbow and wearing a unicorn horn have been printed on everything from pillows to sticker to t-shirts that have literally been worn around the world (by Tai and Jill’s friends). Fred would always come to Jill whenever she called his name and seemed to know exactly how she was feeling, comforting her when she was sad and always being there for her when she needed him. Sometimes, during dinner when Tai and Jill were eating their meal at the table, Fred liked to jump up on Jill’s lap and then perch himself up on her shoulder so he could look out of the big window to the neighborhood below. In the mornings Fred would often be Tai’s alarm clock by sitting on the bed looking down at Tai and making noises like a pigeon until Tai would wake up. It’s been a very difficult adjustment saying goodbye to Freddy. He’s been Jill’s best friend for 17 years, always by her side, partners in crime. “Home” was wherever Fred was at. She and Tai will never forget him and will love him always. Sadie was a sweet Shorty Bull survived by Roberta, Scott, Sue, Taz, Mojo, Kaji, Django, and Cha-Cha. She was so pretty, smiled a lot, and wiggled her whole body (throwing back her head to do a short “woooo”) when she greeted her family that they wanted to give her a cute “little girl story book” name, and so they chose Sadie. She would try to copy the other dogs by sitting up on her haunches, but because she was a bit on the chubby side, she would sometimes fall over. Sadie loved all kinds of food and even linked chewing on the chunky end of a head of Romaine lettuce. She also loved small, soft toys; chasing the laser light; going after birds, and having her belly rubbed and head scratched. Sadie’s sweet spirit and big smile truly brought out the best in everyone. She is missed so much. Abe brought everyone he met joy and happiness. A true gentle giant in so many ways, Abe had the most loving character you could ever imagine. He will always be remembered for sneaking naps on the couch and sandwiches off the counter. Whenever we would return home, we would hear a loud thud as he jumped off a bed. He’d give us a look to say “I wasn’t on your bed”, but the evidence of blankets in heaps and slobbery pillows would suggest otherwise. Abe was born in Washington state and had the chance to live there along with Alaska and Hawaii. He was happy anywhere he went as long as we were all together. Abe will be missed by his family and so many that grew to love him. We say farewell till we meet again buddy. Saying goodbye to Munchkin was one of the most difficult things that I’ve experienced in my lifetime. She was my best friend. This Scottish Fold beauty, who behaved more like a dog than a cat, came into our lives and it was love at first sight. My son was in second grade at the time and really wanted a pet cat. We looked for kittens for quite some time and then Munchkin turned up at a co-workers house and was brought to the Humane Society and held for a week. Nobody claimed her so we went and signed the adoption papers without seeing her first. She definitely found us. Munchkin brought so much joy into our lives. No matter what we were doing, she was involved. If my son was doing homework, she would sit on his papers and she would always join in when we were playing a good game of checkers or chess. She loved being around us as much as we enjoyed her company. Munchkin even decided to jump into my relaxing lavender bath, which didn’t last long once she dove into the water. This happened not once, but twice! She didn’t like to feel left out. If we were not feeling well, she would always come to snuggle and provide comfort. This was true even in my last hours with her. She was still providing that unconditional love. Munchkin loved taking a drive in the car. She would sit on the car seat and relax or put her paws on the window and take in her surroundings. And although she was a house kitty, she had to have her daily dose of sunshine where she would lounge on the porch or a grassy area in our yard. She was a vocal kitty and always “talking” to us. She’d greet me at the door when I got home and expected some treats and snuggles. I miss Munchkin’s exuberant, fun and silly personality. I miss her constant need to be involved and of course, her warm and comforting snuggles. Pikake joined her family when Sherisee and her grandma saw a sign advertising puppies for sale at the mall. She took to Sherisse instantly and showered her with kisses – which is how she would always greet her when she came home. Sherisee knew right at that moment that they should be together. Named Pikake after their favorite flower, she had many outdoor adventures with her family, including surfing, hiking, going to the beach, camping, and traveling. She went to the grocery store all the time and loved playing with her tennis ball – she would even play “fetch” with herself by hitting the ball with her nose! Her favorite food was white chicken. She would heel without a leash and could play dead and roll over, and over, and over. She was the boss of the other two dogs in her family, and always slept by Sherisse’s head on her pillow. She snored like a human and would sometimes lay on her back with all four legs sticking up. Pikake is survived by her caregivers Sherisse and Kimberly Meyerowitz and their three children Isaac, Joshua, and Angel. She was truly special to her family, and they are comforted by knowing they will be reunited with her someday. Bella rode in the car everywhere with me and was very popular at the Burger King drive-thru and with the plant department staff at Home Depot – Kapolei. (She was a little snooty, however, with the dogs she visited at Petco when we did a treat run.) She sat on my feet while I did paperwork, slept under our bed, and went with me to the beach every morning for coffee and breakfast. On special days, I took her to a beach where she liked to chew rocks and roll in the wet sand. She stood guard for cats in the morning and evening when I watered plants. 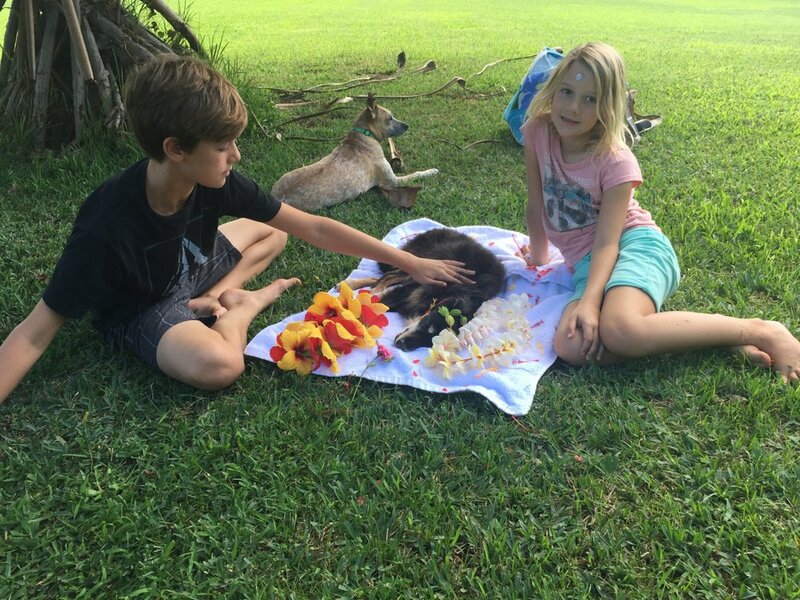 Bella was loved by her whole family. She is dearly missed and remembered fondly. On July 15, 2016 we lost the love of our life and family member, our beautiful Birman cat. Age (16+ years) and failing health took him much too early for us. Miki adopted us in October 1999, after we lost another beautiful family member Kiliki. It was not an easy transition for Sharon, since Kiliki had been predominantly her cat. But it didn’t take long before Miki began to wind his way into both our hearts and wasn’t about to let go. And, it wasn’t just us that he captured. He never met anyone that he wouldn’t rub up to and purr loudly. A little chin rub or a stroke on his white, fluffy tummy, and you were his BFF forever. When we came home Miki always met us at the door with his “where have you been” meow. It is one of the most difficult decisions in life to recognize it is time to let go of a pet-family member, even when their quality of life is so noticeably absent and they have told you so. Trying to make the decision on your own can bring about so many emotions that can confuse and bring about uncertainty, even when you know it is the right thing to do. We’ve shared our story with several other humans owned by pets, and it never fails to bring tears. Vinnie was so fabulous looking plus had a huge personality and of course he knew it! Thus he was clearly full of himself!! He could saunter into a room of one or two guests, or people working on the house, or several people here as company or dinner guests. b). He would allow you to get closer and then he would wrap his big fluffy tail around your leg and let you know you we ok to give him love and perhaps pick him up or he lay on your lap a bit. With me there was no end to how much love he could share and this such a gift! He would even “pet” me back with tapping his tail on my arm or wrapping it around my arm. He gave me even more these past few weeks sleeping with me all night long on top of me or next to me in whichever position I moved in the bed. He was trying to show me back how much he loved me back and wanting me be ok with letting him go. We went through this process together and he let me know the right time. Here’s a classic Vinnie story: Whenever I came home (this with two houses) and before I got up the stairs Vinnie would be scratching and banging on the pantry door where his food was. He was so demanding……I wonder where he got this from …haha!! Here’s another story: When I took Dante in Vinnie was seriously irate, puffed himself up like a lion, then continued to let him know who was boss for 7 years. He even stole Dante’s bed every night, yet he could have my bed at night and any others during the day. Dante was only allowed his dog bed. If I woke up in the middle of the night and saw this I would scold Vinnie off Dante’s bed. Then Dante would immediately get off the rug and reclaim his bed. One morning I woke up and saw Dante curled in a ball on the little cat bed (like he gave up on getting his own bed back) and took the picture here. After Dante died suddenly a few years ago I couldn’t remove his bed so quickly but did at some point. For several days Vinnie slept on his own cat bed (which he never used before) and he stared at Dante’s bed as if trying to convey ..”if you come back I will be a better cat to you”. I think Vinnie “secretly’ loved Dante …he could just never “admit it” until too late. Vinnie came home with me at three months old. He hid from Jezebel and Delilah who didn’t welcome him at first. That changed after a few months and Vinnie ruled from there and they loving him. I have to say with all of the amazing pets I have loved and lost, Vinnie was the most difficult to let go of and my heart still hurting so much! That was his official name on his pedigree papers. From then on it was Vinnie. Other endearing name was Vinka. May God bless his precious soul! About 11 years ago, we were so ever lucky to have inherited this 3yr old female German Shepherd. She was dropped off at the Humane Society and the papers said the owners could no longer take care of her. She was a perfect dog who became the perfect alpha to 4 other dogs, ranging from a Sheltie, 2 Chihuahuas and a Pit Bull/Sharpei mix. My friends could not believe how the dogs got along in one home, having free range in a fenced yard for sun and exercise. Trinity was diagnosed with cancer about 3yrs ago and survived the odds. She was also diagnosed with signs of arthritis in her spine and showing signs of some type of neurological condition which gradually affected her hind legs and the ability to walk normal. Trinity had acupuncture, swimming therapy, and laser from some very loving techs and vet. She was fed special home cooked meals, even chicken feet for collagen. Trinity continually kept trying to walk despite it becoming more difficult as time went on. She was your typical working dog, always wanting to please her master and always keeping a close eye on her master, me. I would have to leave my bathroom door partially open while I’m bathing so she could peek an eye and knew I was okay. She hadn’t been able to get her hind legs to walk for the past 2 weeks and had experience a severe seizure yesterday morning. I could no longer be selfish and think that someday she’ll be able to walk. I had to save her dignity as a German Shepherd. I decided weeks ago that Trinity would want to be at home when it was her time. We allowed Trinity to eat whatever she wanted to as it was now quality of life and pain management recommendations by Dr. Naun. Yesterday, after the severe seizure, we were faced with saying goodbye. I miss Trinity terribly but I’m okay knowing that she is no longer in pain. Thank you Trinity for bringing much happiness to our family and for keeping the other doggies obedient. We just sent our Trinity girl to heaven yesterday. Trinity was a 14 year old German Shepherd who survived Hemangiosarcoma 3 years prior and lost her ability to walk 3 weeks ago. Trinity was a fighter, but her immobility was neurologic and Trinity was no longer able to be her “working dog” self. The decision was very hard because Trinity’s disposition was still good and she seemed very alert. We have had to make this decision to let our beloved fur friends go two times prior and it never gets easy. The feelings are still the same but time truly heals. The pain eventually subsides and good memories of your loved one consume your thoughts. We still remember what a vet tech told us years ago when we had to say goodbye to Mocha and it stuck with us until today. She said, “Letting them go is the most unselfish thing you can do”. It’s hard, but it’s true. To anyone going through this, have faith in your decision.